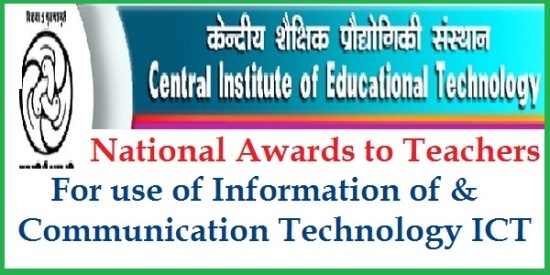 All the District Educational Officers in the State are informed that Central Institute of Eduation and Technology (CIET) ,NCERT, New Delhi is instituting National Award for Teachers for use of ICT in Education and in all 87 ICT awards are instituted by Govt of iNdia for different States / UTs and Autonomous Bodies/ Organisations under MHRD and a break of State wise allocations of awards is enclosed. He further informed that the award proposal to facilitate those who have enhanced student learning by effectively and innovatively integrating technology supported learning into the school curriculum and subject teaching and there by promoted enquiry based Coorporative-Collaborative learning using ICT among their students. And each Awardee Teacher will be awarded with a Laptop and Commendation Certificate. The teacherws of Primary , Upper Primary , Secondary , Higher Secondary Schools are eligible to be nominate under the scheme . A copy of guidelines , Selection Process, Detailed entry in the prescribed proforma are enclosed herewith.